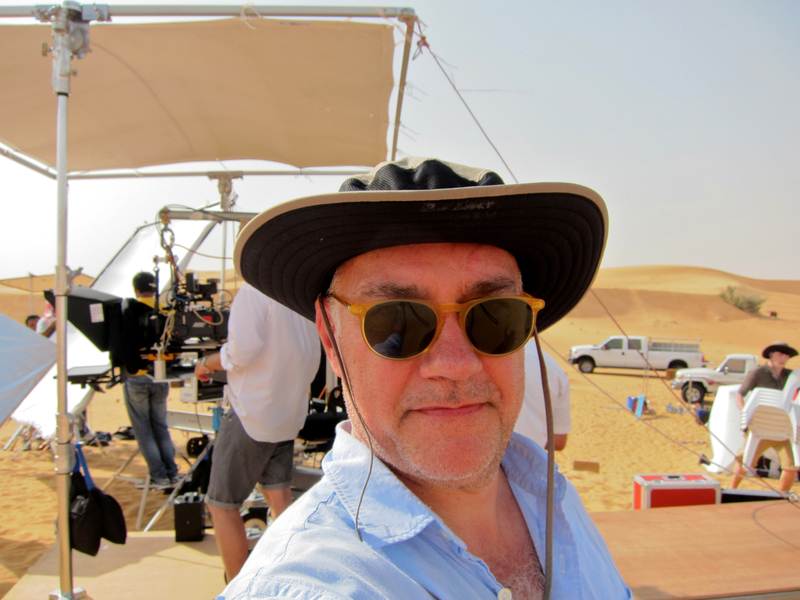 I am in Dubai for ten days, shooting in the desert and other parts of this exotic, peculiar place. Late June is probably not the optimal time to visit this corner of the planet — I have never experienced the sort of oven-heat that suffocates the place over after 9 a.m.
I’m making commercials that will be shown here and around the world. 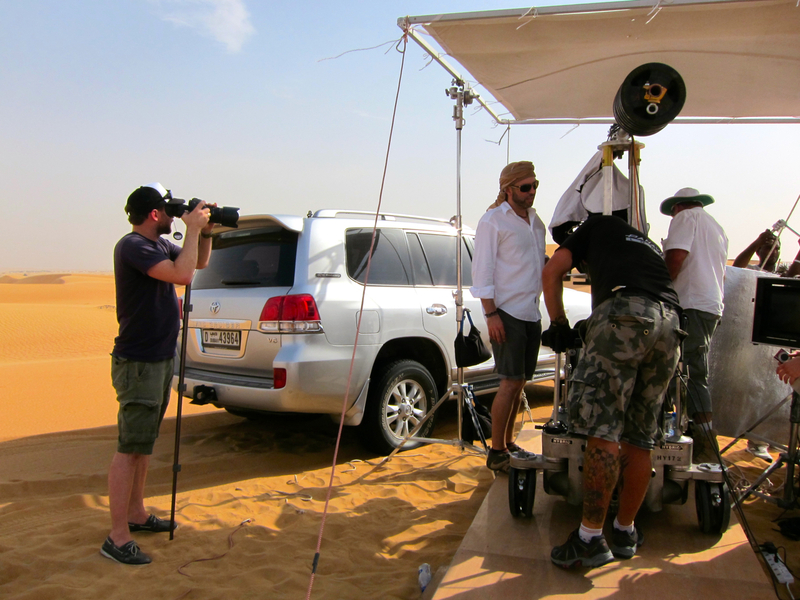 We are shooting in English and in Arabic. 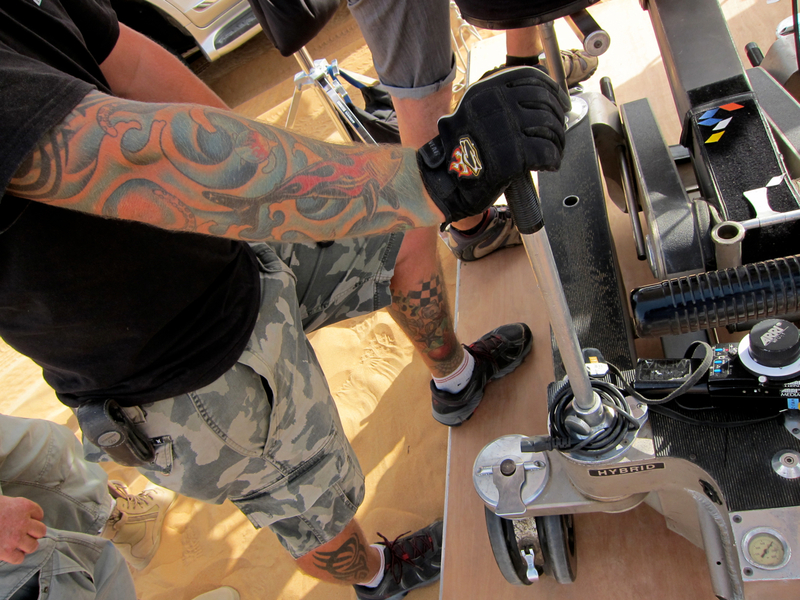 We are also making a film about the shoot itself. It’s all quite complicated. 90% of the people in Dubai are not from here. They come in search of opportunity and a piece of the oily pie. Our crew is English, American, German, Pakistani, Indian and me. A horrible accident. 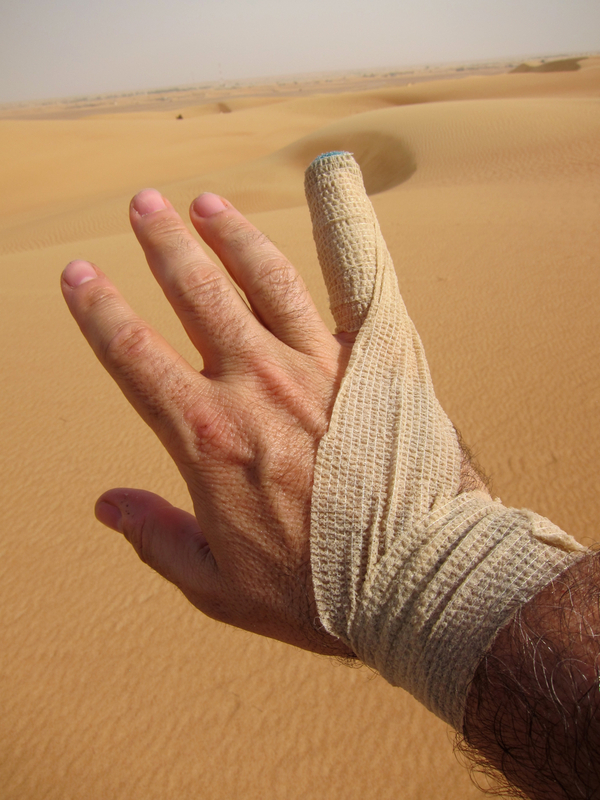 I somehow sprained my pinky. Forty eight hours late, I was miraculously healed. My journal looks a little more austere than usual. I only brought my trusty Lamy Safari fountain pen with me and a Q-tip made a serviceable brush. If you click on this picture, you can see a blowup of the page and read my most intimate thoughts. 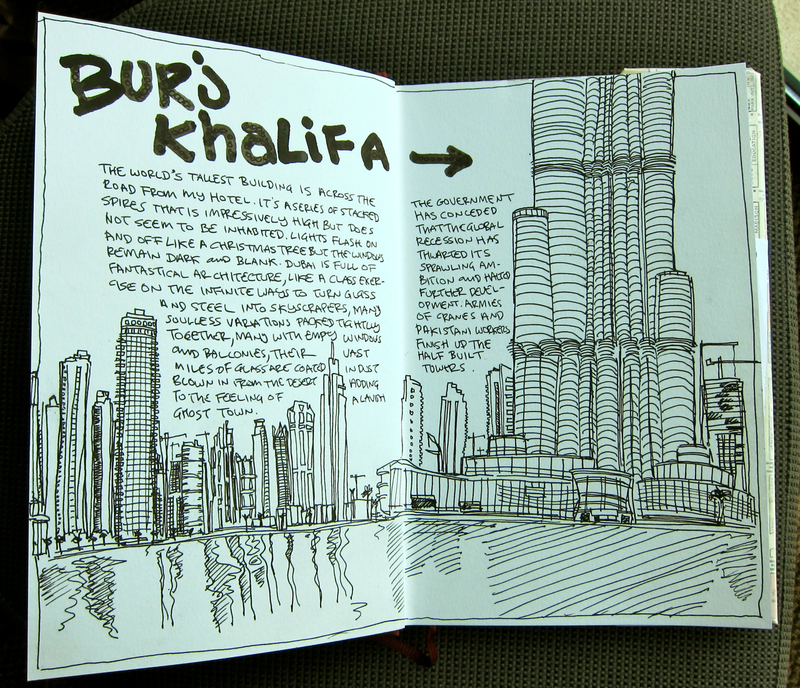 Some thoughts on my neighbor, the world’s tallest building. I’ll try to post some more notes over my remaining days in Dubai. What a glamorous life you do lead! I too am not too fond of extremely hot weather, which is a plus since I live in the UK, where extremely hot weather flattens us Brits. Love the photos and the drawings. Just goes to show that even with limited supplies all you need is some paper and something to write with. Hope you don’t melt, probably you will find just as it is time to return home you will begin to get accustomed to it. It will make you appreciate home that’s for sure. Who knew most of those lavish tall buildings are uninhabited?? 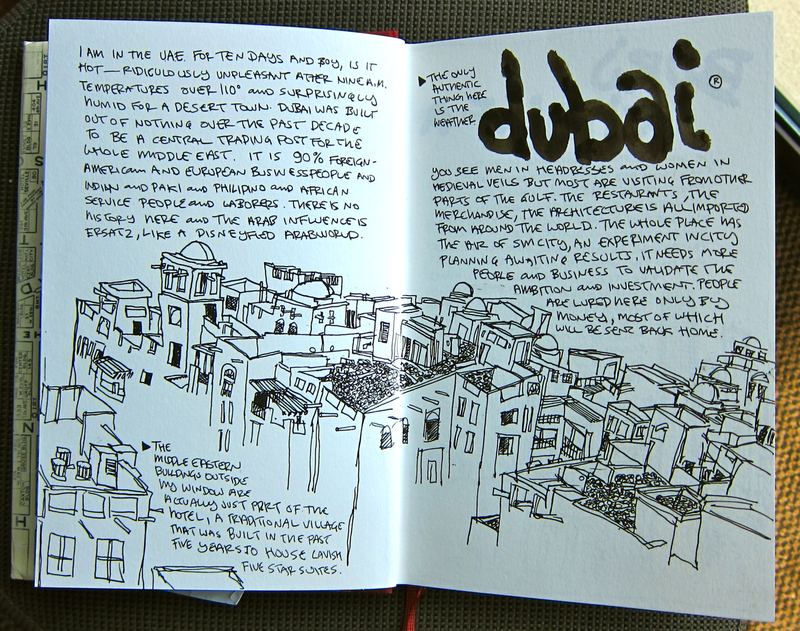 That part of the story is untold, but thanks to your generous sharing of your journal pages, now I’m getting a glimpse of the real Dubai “behind the scenes”. At first glance, it looked like the tip of your pinkie got cut off! Whew…glad it was only a sprain in comparison. One never realizes how much their pinkie does until it’s out of commission. I always wondered about the dust and sand in such a lavish city…something no one can control. Thanks so much for sharing. This is fascinating and I hope you will be able to keep sketching a bit. What an unusual vacation (?) work experience. Forget the great sketches, great sunglasses. I want a pair. Danny, I love the journal pages. Glad to see you are wearing a hat! Hope it all goes well.